Shane Wright and Murray McKnight spotting a monster. 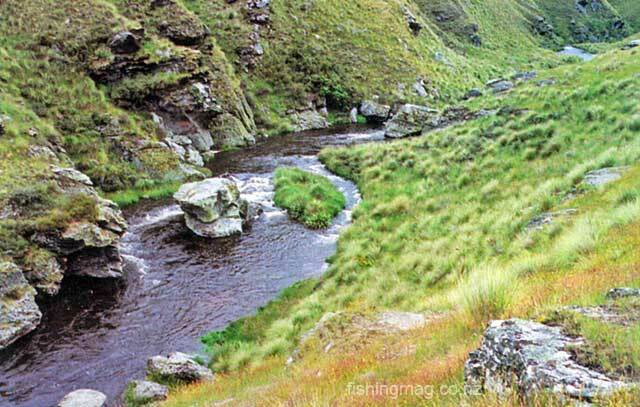 Sprinkled throughout Otago and Southland are many small streams which are well known because of their good sized fish and peat-coloured water. 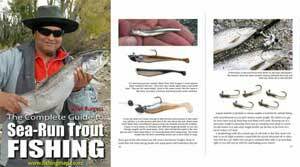 Although the majority of these water fish particularly well at the beginning of the season, once the water dwindles some excellent stalking of trout and fishing of runs is available. Early in the season fly anglers have generally fished these waters with large nymphs, dropping down to small nymphs as the water recedes. The majority of them are renowned for their mayfly hatches which often occur about 11.00am on most days. Sometimes though in summer, the mayflies will continue to come off the water throughout the day and they are replaced in the evening by sedges. Of course, the most common nymph used in these waters is the hare and copper, but in recent years many anglers have replaced this with the gold bead heads. Back in the 60s, I fished a lot of these waters and still do today with a modified Hare’s Ear nymph. The reason for modifying the nymph was because of the Coloburiscus. These mayﬂy nymphs are common in small, clear streams through the southern region and are even found in the bush covered streams along the coast. They are the bulkiest of the mayflies with heavy gills protruding from their bodies. When these mayflies hatch, they have a yellow spot at the base of the wing and are known in the mayﬂy world as the Kakahi Queen. In some waters, such as the Tahakopa and the MacLennan these mayflies are particularly large. I often fish them on size 10 and 8 in a dry fly, but in some other rivers in Otago like the Teviot, they are a more uniform size, about 12. There is one variation though in this water, that they are a lot lighter in colour than those in the coastal streams. Getting back to the nymph, sometimes when these mayflies hatch they have difficulty like all mayflies do, breaking through the surface film and when doing this the yellow mark at the back of the wing case is often seen. By tying the yellow or ﬂuorescent lime thread in a hoop circle around the body of a normal Hare’s Ear nymph, you create a similar effect. I fish these in the small streams in weighted and unweighted. When fishing the weighted nymph generally on a size 14 nymph hook, it acts as an attractor to the fish as it rumbles down through the rocky shallow runs, and as an unweighted nymph, it acts in the same way as l mentioned earlier when the nymph is fighting to get through the surface film. On some days on these streams, trout often hook into this particular species, and although you can see many fish rising and moving in the water, it is very difficult to catch them if you do not have the correct nymph. This has happened to me several times on the headwaters of the Catlins when the large mayflies are sitting on the surface. Unless you can match the hatch the fish continually rise to the surface, but in the last 30 centimetres turn away from the mayfly, and in some cases whack at it with their tails. This type of fishing will continue right through until February on most of those small, peat coloured streams. In December, often the beetle season has started and brown beetles coming from any cultivated paddocks which are nearby are the adults of the grass grubs and they continue to land on the stream during the evening, making for some excellent fishing. To imitate these, in the past we have used Coch-y-bondhu patterns or Eta foam or Hardcell foam just to sit on the water. After dark, the Hardcell foam patterns, which is just Hardcell foam cut to a beetle shape and secured onto a dry fly hook, work very well as you know that they are on the surface all the time. You can buy black or brown Eta foam or use any other colour Eta foam and colour the underside of it with a felt pen. After doing this though leave it for half a minute then squeeze it with some paper tissue just to take the surplus off the outside. It does not dry onto the Hardcell foam very well but does fill the pores giving the correct effect. Of course, the green beetles are also landing on the water at this time of the season, and they will go through until the end of January or as in last season when they continued well into February. The same beetle imitations can be used for these fish. When fishing smaller waters such as these, it is imperative to wear the right coloured clothing. This has to be browns, dark greens or fawn colours that break your outline up so you can fit in with the countryside you are fishing in. 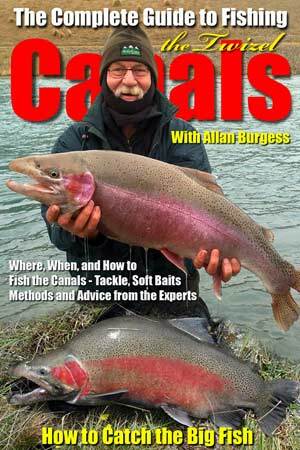 Some fly anglers even go as far as to having special fly vests that they fish on bright days and dull days. 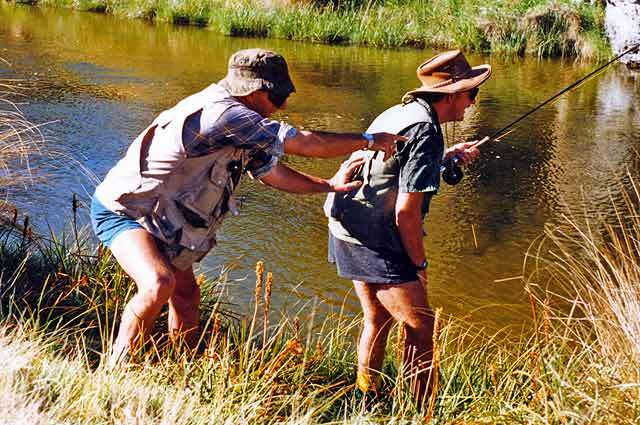 Of course, by this time of the year you have generally changed over to your shorts to fish in. Remember the sun lotion for the legs and how white they are at the start of the season, a dead giveaway as you move around the side of some of the waters. The same giveaway is on your face, but by wearing wide-brimmed hats or any hat breaks this up. Of course no anglers outfit during the summer is complete, or even at any time for that matter, without Polaroid glasses, These allow you to see exactly where you are putting your feet, observe what the fish is doing when you pass the fly over him, whether he liked it or he didn’t like it or didn’t even move, giving you that added advantage of catching that extra fish. Move slowly as you walk up to the edges. Do not make excessive amounts of noise or clang and bang rocks together as you jump down from banks. This is very important because in many of these small streams the fish will immediately go for cover once they hear a solid thumping noise. When fishing these small waters keep the line short and the floating line well cleaned so it floats consistently on the water. Of course. in some of these sections, there will be the nursery areas where a lot of small fish will live. When ﬁshing your way through these areas it pays to use a large fly as often the small fish will not attempt to take them and it means that you do not have to continually release them. 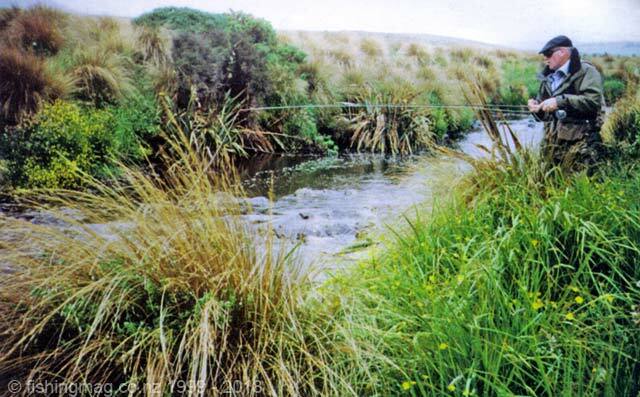 The important area to ﬁsh all the time is along the bank margin where any overhanging flax, tussock or rocks give protection or homes to the trout. This is one of the reasons that you have to be well clothed and use a very short line. as some of these runs are quite short and if using a long line it will pull on the surface. If fishing areas where you know some large fish are, it also pays to fish in pairs taking turns with your friend as the spotter. l know that often in peat-coloured water it is difficult to spot fish. If this is the case you have to continually fish through the sections of water that you think may hold the fish. One other point to remember is that some of these areas will only have a small amount of fish remaining after December, so only take what you need as they should not be classified as high kill areas. There are plenty of sections of the river downstream where it does not matter how many fish you take out of them. In fact, you would probably be assisting the area by removing some of those fish. Selwyn Shanks fishing a small stream in Southland.